Have you ever been really frightened about the future? Almost every adult can say “Yes” to that question! But what if the television began to warn and threaten you about the future? You personally! That would be really terrifying, wouldn’t it? And what if total strangers stopped you and made really ominous innuendos about Hell…and eternal torment? And what if those strangers began to make taunting whisperings about that eternal torment? And then, what if you picked up a magazine, or a newspaper, and began reading, only to see even more frightening allusions about Hell…eternal Hell?! As the days went by, things deteriorated rapidly. Each day, I would go out to the main sitting area, to see what the TV had to say. I learned quickly that the TV, somehow, was in-sync with this contest! Often, some sports announcers might be joking about the “terrible defeat”. They might make remarks about “what a great loss!” They would use phrases such as “a very poor showing”. This would “greatly reduce the odds for a chance in the finals”. Now I’m fully aware that such things are normal sports lingo. But it seemed that I always turned the TV on at just the exact right time to hear what the spirit wanted me to hear! If I happened to sit down and someone was watching cartoons, then it wouldn’t be long until I be came terrified by the message from the cartoon characters! And this flawless timing was the true impetus of the television’s demonic torment! It wasn’t so much what they were saying. But it was how timely and omniscient the television became! It almost seemed to be alive! Well, at least it certainly seemed to be very controlled! Anyway, these were the kinds of pertinent remarks I would hear during my contest. Stinging innuendos! Ominous whisperings! Terrifying forebodings! However, one could easily make the case that I happened to sit down just at the right time. Or you could easily say that I was an extreme paranoid. Well, I will say that, yeah, it’s definitely true that I could have been manipulated by the spirits to sit down just at the right time. But the spirits had to have known what was going to be said on the TV programs prior to me watching them! So whether or not these TV shows were actually being produced by the spirits, or whether I was merely being scheduled by these spirits to watch something on TV, it was basically being manipulated and controlled by these Unseen Ones. I have a notion that, to a certain extent, both cases were true. “Put on the whole armour of God, that ye may be able to stand against the wiles of the devil. For we wrestle not against flesh and blood, but against principalities, against powers, against the rulers of the darkness of this world, against spiritual wickedness in high places…above all, taking the shield of faith, that you may be able to extinguish the fiery arrows of the wicked.” Ephesians 6:13-16. If only I had known that this world was filled with spirits, both good and evil! If only I had known that there was a way of protection! But sadly I didn’t know a thing about the “Armor of God”! And I knew nothing about “fiery darts from the Wicked One”! Oh-h the TV! The TV! It was little comfort during this contest! And though I would often go to it, in order to check my progress. But it was amazing how it always had exactly the wrong thing to say! It was amazing how the sarcasm was always exactly what I didn’t need to hear! And equally amazing was, that even cartoons and situation comedies just seemed to fit the occasion perfectly! All the tongue-in-cheek insinuations! The elbow-in-the-ribs needlings! I can’t think of a horror movie that would be a good example of how TV could be so satanic in a satirical way! But maybe there is such a movie. I just haven’t seen it. It got to the point that I became afraid of watching TV! And of course, all this was totally overwhelming! Never before in my life had TV taken on a life of its own! Never before had I experienced any such supernatural phenomena with this inanimate piece of wood and plastic and glass and metal known as “Television”! Before all this, it was just a mindless invention of Man! Man was in control of it! It was simply a tool…a machine….like a record-player, or a camera. For me, this incredible invention had been just a benign little entertainment device. It had been a real comfort, entertainer, and companion since being a little boy! But now, all of a sudden it had become some sort of satanic tormentor! It became apparent that the spirits could use humor in a very devastating way. It was the most effective way that the spirits could destroy me. In other words, taunting ominous humor can feel really, really evil…when they come from unseen spirits! And so I began to realize that the things I loved, such as TV and its humor, could be the most effective weapon in the hands of these spirits. And what I thought was harmless, could be used in an incredibly hideous and ugly way! And what made it even more devastating, was that anyone else watching the TV with me, had not even a hint of a clue of what I was seeing and hearing and going through! For instance, I remember sitting down at one point, just as the final scenes from a James Bond movie was airing on the TV. Now, normally I would have loved a good James Bond flick! That’s the kind of movie I liked! Action! Intrigue! Exotic places and beautifully dangerous women! But at this moment, it was like watching him through some Mirror From Hell! A television from Hell! It was totally surreal! As Bond escaped from some dangerous situation, I became shocked at how this all seemed to relate to just what I was going through! As he ran through the jungle from the bad guys, it just seemed to be a very real allegory as to what I was going through. Suddenly, he came smack-dab into the presence of a giant grotesque statue of a pagan god. Bond stopped and looked shocked to see this monstrous devilish-looking stone idol right there in his pathway. He then resumed his escape or pursuit! And as I saw this scene unfold with all these seeming parallels to my situation, I began to wonder if these spirits had made this scene especially for my situation! That stone idol looked very satanic. This scenario seemed to fit this horrible contest I was now going through! Now I’m not saying it was made especially for me. But at the time it sure seemed like it was! After all, the fate of the world rested upon my shoulders…or so I was being told by the spirits. COULD TV BE PART OF LAST DAY JUDGMENT? At some point, I began to wonder if all the programs on television had been developed by these spirits simply to torment people on Judgment Day. You know, like maybe the Devil is producing all these shows for just the right time. And even though these programs were outwardly very benign and harmless, but nevertheless having hidden satirical double-entendres, designed to mock and deride people on Judgment Day, as the people of the world try to watch TV on that day. In other words, the unsuspecting masses will simply turn on the TV, not realizing that Judgment Day has already begun, only to find these so-called “harmless programs” have “grown sharp teeth”, so to speak, and have become the instruments of cruelty and death, in the hands of Satan and his evil-angels! 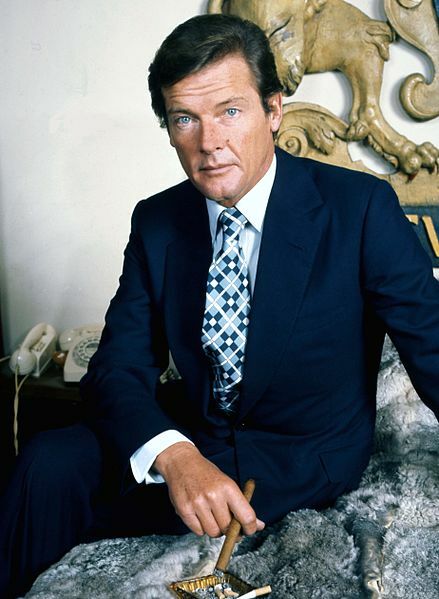 Photo of Roger Moore courtesy Wikipedia. Share-alike license. Click here for link. Now, as to how I was all-of-a-sudden getting hidden meanings, let me just say, this was a brand new phenomenon for me to be interpreting things as allegories. Before my troubles began, I never, never interpreted anything allegorically! I never got a deeper meaning out of things I saw or heard or read. So why was I now interpreting so many things in an allegorical way? The Bible is filled with many, many allegories. For instance, the book of Proverbs is filled with many allegories (parables or proverbs). And Jesus often spoke in parables. Ezekiel, Isaiah, Jeremiah, Job, etc., spoke in parables. But those allegories in the Bible are interpreted correctly with the aid of the Holy Spirit. 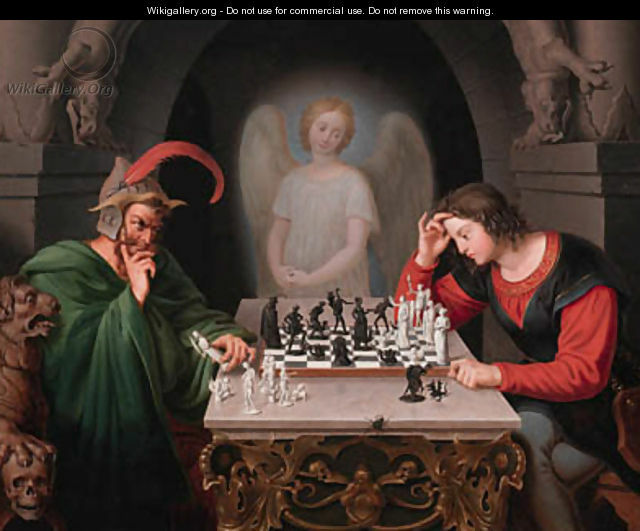 So the question to be answered is this: “Was I filled with the Holy Spirit during this time?” Was that why I was seeing allegories in so many things? Or were there evil spirits at work, making me see “deeper meanings” in so many things? Actually, I didn’t really even question this phenomenon at this point. No, right at the moment, I was on a roller coaster ride through some sort of fiery, devilish theme-park! I didn’t have time to do much deep questioning about the “why’s” concerning my troubles! Oh yes, I was amazed and bewildered by what was happening. But as for answers, I didn’t have many! I just knew that there really indeed exists a spiritual realm! And I was now very directly in touch with that realm. “Sermon On The Mount” by Bloch courtesy Wikipedia Public Domain. I was watching short snippets from sit-coms; the actors wryly smiling, as if they were mocking and taunting me with their little sarcastic jests…“Guess who’s gonna flunk his big test today?”, one actor would say to another. “Oh yeah…I know, Dude”, answered the other actor… “Somebody forgot to do his homework!” Then they would both laugh, and walk off together, still laughing! These and more were the types of subtle comments being shot at me from the television, like a Gatling Gun! So you see, the above verse talks about “hearing blood”. So drinking blood in Scripture doesn’t necessarily mean literal blood. You can be drinking blood by, say for instance, watching violence on TV. And the violence that I was now drinking in, was directed at me…by the spirits! And I was hearing and I was seeing blood! Violence! Directed at me! Now I realize and fully understand that TV can be a real comfort to people. Especially the elderly, as well as shut-ins. But for me, TV was no longer my friend! I was now the enemy of the invisible powers. And they were out for blood…my blood! And if you think about it, the name “television” is made of two Latin words…”tele” and “vision” which literally means “talking vision” or perhaps, “talking image”. Never before in Man’s history, was there ever such a thing as a “talking image.” Jeremiah 10:5 speaks of idols (images) in this way…”They are upright as the palm tree, but speak not” (Jeremiah 10:5). The images (idols) of olden times were made of brass or wood or stone. The Bible refers to them as “dumb idols”. They couldn’t walk. They couldn’t talk. But the Bible speaks about the day when an image will have the ability to speak. That day has come, or so it seems! Television. Internet. Movies. These are all present-day talking images. Oh yeah, the images are constantly changing. But make no mistake! They are images that speak! “Nebuchadnezzar the king (of Babylon) made an image of gold, whose height was sixty cubits, and the breadth thereof six cubits: he set it up in the plain of Dura, in the province of Babylon…Then an herald cried aloud, To you it is commanded, O people, nations, and languages…That at what time you hear the sound of… all kinds of music, you fall down and worship the golden image that Nebuchadnezzar the king has set up: And whoso falls not down and worships shall the same hour be cast into the midst of a burning fiery furnace.” Daniel 3:1,4,5,6 (condensed for brevity & context). For me, prior to all my present troubles, the TV had become a false prophet. It was like a Pi ed Piper. Like those proverbial Lemmings, TV was leading me (in former times) down the road of ruin to fall over a cliff of destruction. Not that I had become dysfunctional prior to this. But I had, over the years, without knowing, become changed, little by little into the same image of Satan, (to a lesser degree of course!). And the TV had become worse and worse since I was a little boy. Now I know it seems like an extreme statement… ”changed into Satan’s character”. I know, I know! But please bear with me, and I’ll explain. By the time this all began, I came to somewhat possess Satan’s character. But the TV had taken me further and further into evil. For instance, in the fifties, a married couple on TV couldn’t even sit on their bed, unless their feet were touching the floor. And do I need to tell you how much worse it had become by the seventies? Either way you slice it, it comes out the same… “Garbage in…garbage out”. But let’s get back to the question of “Just what are the attributes of Satan?” As we read Scripture, we find that Satan’s qualities are Pride, Violence, False Science, Dishonesty, Lust, Greed, Hatred, and a Form of Godliness. Now, you might be wondering how “a form of godliness” could be one of Satan’s qualities. Satan knows that if he only had evil qualities, he would blow his cover, so to speak. So in order to deceive the world, Satan must work under a cloak of false humanitarianism. So, before all my troubles began, I had somewhat an appearance of goodness. I suppose I had some morals. I wouldn’t think of killing anyone. OK, that’s one good quality……Oh, there must’ve been other good qualities in me. Well, when I think of another one, I’ll let ya know. OK, OK, I know one! I was a good tipper at restaurants! Oh yeah, and also, I was punctual getting to work! And I tried to do a good job at work! OK, so I had some correct behavior. And I was usually pleasant to people…to their face. So I had good morals…and… I had some bad ones too. The contest continued. I underwent similar tests. I was losing them all! Not only were the spirits and the TV condemning me, but my patient-representatives were preparing for release from the ward. I was losing the chessmen!! This second part to the previous chapter, is the frightening story about the interaction between these spirits and the TV. This story raises some issues that are incredible, to say the least!